Over 30 percent of boating fatalities in Minnesota happen in cold water with a victim not wearing a life jacket. Falls overboard and capsizing are still the most common cause of boating fatalities in the state. Falling into icy water can be deadly because many boaters do not think about the effects of cold water immersion. 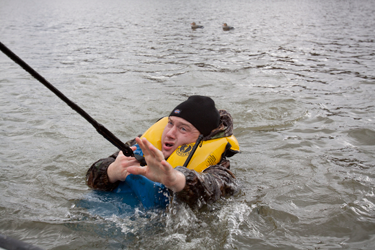 Wearing your life jacket could be the single most important factor in surviving cold water immersion. Cold water immersion can kill in several ways, and most people die long before they become hypothermic. Drowning if not wearing a life jacket. Rapid cooling of arms and legs impairs the ability to keep the head above water. Effects occur regardless of swimming ability. Cooling of the body's core temperature results in gradual loss of useful consciousness. Assess the situation and make a plan. Perform most important functions first, such as locating other party members. Practice emergency communications and signaling. If the boat capsizes or the victim fall overboard, stay with the boat and try to reboard. Most capsized watercraft will still float. A craft in the water is easier for rescuers to locate. If you have to remain in the water, do not attempt to swim unless it is to a nearby boat or floating object. Keep boots and clothes on. Almost all clothing will float for an extended period of time. While wearing a life jacket, float on your back with your head and feet out of the water. Reduce the effects of cold water immersion by assuming the heat escape lessening position (H.E.L.P.). Hands should be kept high on the shoulders or neck. Lean back and try to relax. Practice H.E.L.P in a pool first, before depending on it in an emergency. If more than one person is in the water and wearing a life jacket, the "huddle" is recommended. This is where small groups of two to four "hug" with chests closely touching. Arms should be placed around the backs of the others and kept underwater, while smaller individuals or children can be placed in the middle of the "huddle." The huddle helps to conserve body heat and it is also easier for rescuers to locate than one lone victim. The close proximity of victims can serve also as a significant morale booster. Wear a life jacket- Minnesota law requires a wearable U.S. Coast Guard Approved life jacket for each person on board a watercraft. Prevent capsizing- Reduce speed in rough water, don't overload a boat, secure loads from shifting and adjust for changing conditions. Prevent falls overboard- Remain seated while underway, avoid a sudden shift in weight. File a float plan- Leave it with a responsible person. Include a description of your boat, names of passengers, boating location, time of return and description of your car and where it is parked. Tell the person to call 911 if you don't return at the expected time. Brief passengers – Everyone should know where all safety equipment is ( and how to use it), and how to start, stop and steer a boat. Be prepared- Always wear a life jacket every time you step on a boat. Trying to put your life jacket on in the water is extremely difficult (if not impossible) and costs precious time and energy. Carry a whistle or horn- Minnesota law requires a whistle or horn on all motorboats 16 feet or longer. Keep an eye on the sky- No boater should ever set out in a storm. Carry a compass and chart. Carry a cell phone or two way VHF marine radio. The U.S. Coast Guard monitors Channel 16. Take a boater safety course.